As I write, Andy Tudor is putting together the finishing touches to our front cover which will be released on National Libraries’ Day (8 February). Subsequent chapters will then follow on a monthly basis. 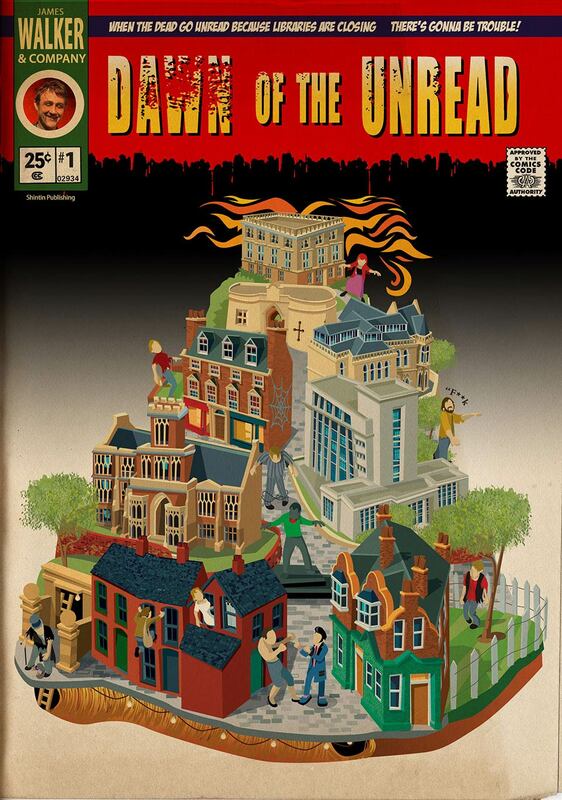 The front cover will come with some basic instructions on how to either ‘read’ or ‘play’ Dawn of the Unread so that users are comfortable with the set-up and we can get a little feedback if we need to make any tweaks. Releasing the chapters monthly may ‘kill’ a little of the immediacy associated with reading but it’s a necessity to ensure we are able to create content in time. With letterers, colourists, computer coding and various other embedded content involved, this is a complex baby that requires time. But it is also a reading project with set tasks, so a month enables readers to fulfil various tasks to ensure that they can properly engage. It also means we’re drawing on that great tradition of the ‘serial’, the format that teased the readers of Dickens and Conan Doyle. 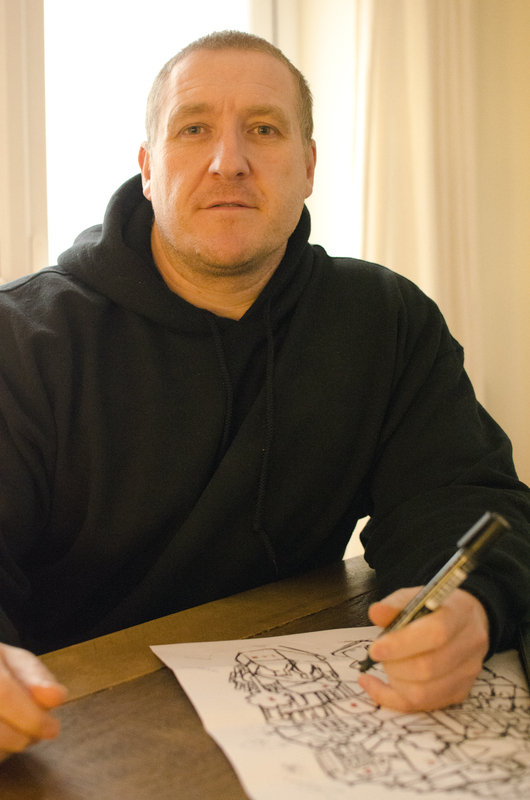 Andy Tudor is our cover artist and will also be working with Paul Fillingham on the production and design of the physical book. Having seen Andy’s illustrated childrens’ picture books for Usborne, I know this is going to be a thing of absolute beauty. In addition to designing the front cover, Andy will also be producing 12 illustrations for a specific location related to each of our literary figures. These will appear in the digital versions and as inserts in the book. This is not something I budgeted for but it had to be included as it enables Andy to stamp his identity on the project, something I encourage with all contributors. Last year Andy did illustrations to accompany an app called Dragon Run Saga, a fantasy adventure serial in audio form featuring vampires, goblins and necromancers. He’s also working on artwork for another app that aims to encourage young people to get into creative writing and storytelling. Andy is part of the ‘Storia’ creative team which aims to develop ‘storyworlds’ that work in different media. One example of this is Spacers, which is set on a future Mars colony, featuring a group of kids and their adventures. It’s the biggest body of work he’s done for one project so far and includes characters, vehicle design and environments. Given we are producing content across media platforms and also hope to find ways to encourage people to read, Dawn of the Unread is a home from home for Andy and I’m hoping the contacts he makes with Paul Fillingham and other members of the team will lead to future collaborations. But the main reason Andy is designing our cover is because of his current fascination with depicting urban landscapes. “In these real or imagined places my intent is to capture a sense of building and structure, and the life within. The images are large and involved, and I love the idea that the layers of visual information slowly reveal the detail and reward the viewer who spends time in front of the picture” he said. One of his most recent pictures was selected as one of the top 50 in the Serco prize for Illustration competition run by the Association of Illustrators and is being exhibited in Covent Garden from February to April. It tells the tale of the infamous barber Mr Sweeney and his pie-making friend Mrs Lovett. I have asked Andy to recreate this with a Nottingham theme, to tap into the real locations and the folklore of our 12 featured literary figures. From what I’ve seen so far I think it’s one of the most beautiful pieces of artwork I’ve ever seen and I’m absolutely humbled to have DOTU associated with his work.